With oil prices remaining well below highs experienced prior to 2014 and with OPEC's production constraints deal actually resulting in higher U.S. oil production levels, recent news from the United States Geological Survey would suggest that oil supplies will continue to be problematic for producers who are awaiting a return to the $70 to $80 per barrel level last seen in mid-2014. 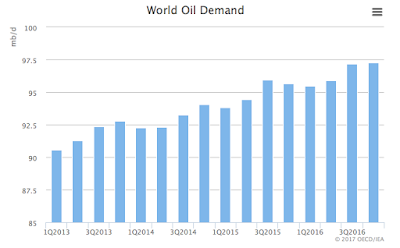 Domestic oil production peaked at 9.61 million barrels per day during the first week of June 2015 and fell to a low of 8.428 million barrels per day during the first week of July 2016. While this 12.3 percent drop would seem significant, at more than 8.4 million barrels of oil per day, production is still far higher than it was prior to the mid-2014 price "cliff". In fact, during the first week of March 2017, oil production increased, hitting a high of 9.088 million barrels per day. 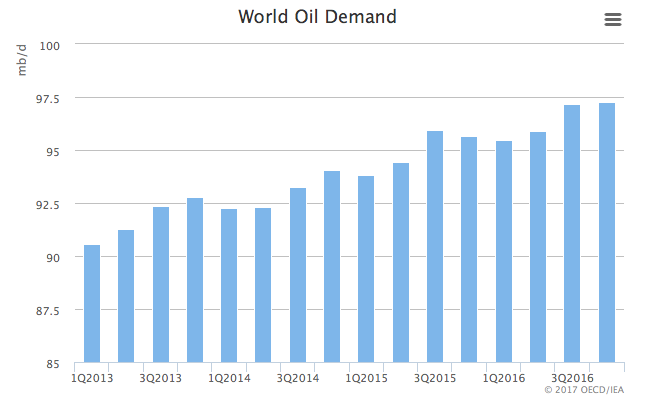 The International Energy Agency predicts that oil demand growth is set to rise by only 1.2 million barrels per day in 2016 thanks to dropping demand from the Americas and China. This is down from demand growth of 1.8 million barrels per day in 2015.
continuous - oil and gas that is dispersed throughout a geological formation rather than existing as discrete, localized occurrences. 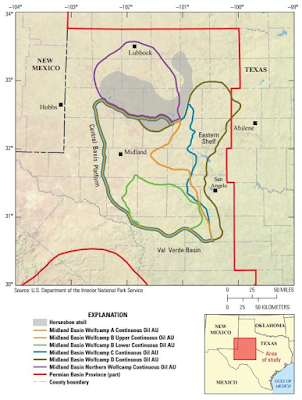 Exploitation of these reserves require special recovery techniques including horizontal drilling and hydraulic fracturing. undiscovered - resources postulated, on the basis of geologic knowledge and theory, to exist outside of known fields or accumulations. Included also are resources from undiscovered pools within known fields to the extent that they occur within separate plays. technically recoverable - those resources producible using currently available technology and industry practices. USGS is the only provider of publicly available estimates of undiscovered technically recoverable oil and gas resources. 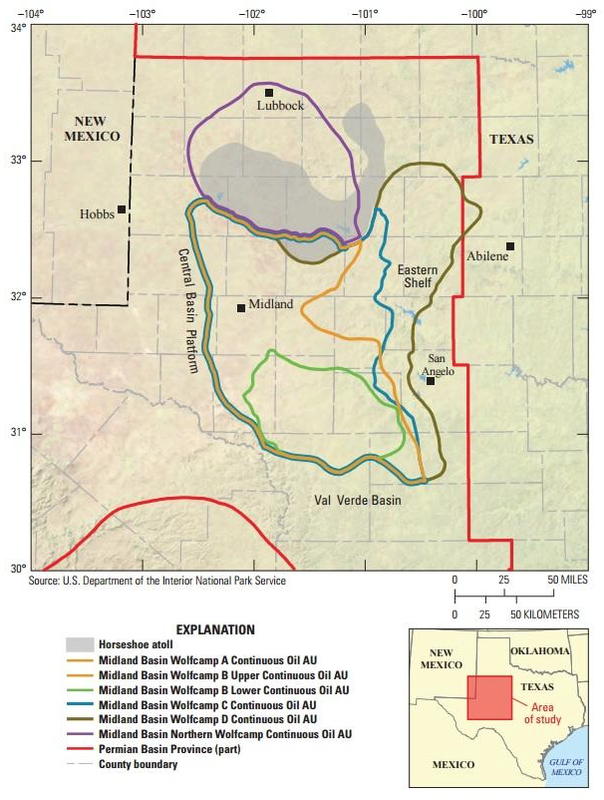 To date, more than 3000 horizontal wells have been drilled at completed in the Wolfcamp in the Midland Basin; additionally, since the Wolfcamp shale is present in the Delaware Basin portion of the Permian Basin, reserves may be higher than the current assessment shows. If you are interested, the entire USGS report can be found here. In 2014, for the first time since 1972, U.S. oil proven reserves exceeded the 39 billion barrel mark or just under twice the mean technically recoverable reserve estimate for the Wolfcamp. The recent analysis by the United States Geological Survey shows us how significant the Wolfcamp shale play could become as part of America's move toward energy independence and how exploitation of this resource could impact the very delicate supply - demand global oil market balance in the future. Given that the mathematical odds of a global recession are growing by the day, a return to the halcyon days of triple digit oil prices look increasingly unlikely.